with this, we would like to invite you to our “Open House Day” on June 22nd 2019 in Sonneberg/Thuringia. This already marks the 11th time, we celebrate this special occasion with model railway enthusiasts from all over the world. In 2019, the “Open House Day” also celebrates the 70th anniversary of PIKO and we would be delighted to welcome you and many more fans of the brand PIKO in our headquarters in Sonneberg. Experience our broad range of products in the four scales G, H0, TT and N, look over the shoulders of our employees in the G scale production and actively discuss our models with our constructors. On the occasion of our “Open House Day” you will be able to purchase attractive special edition models and discounted second-rate quality products. For our youngest guests we offer a PIKO G Scale layout to play with and many more game stations as well as a large bouncy castle. We are pleased to cater for your every need with our delicious Thuringian specialities as well as warm and cold beverages. To make your destination to Sonneberg an unforgettable experience, we offer you historical chartered trains that carry you to us from various locations. Of course, you can also reach us by “regular” trains. There will be a shuttle service from the Sonneberg train station to the PIKO site. We are looking forward to your visit and wish you a pleasant journey and an exciting day here in Sonneberg. Inter-Zone train D 439 Cologne – Hamburg – Lübeck – Rostock BR 132 DR with three express train cars of the DB BDm and Bm era IV. The separation of Germany into occupation zones and the foundation of the FRG and GDR separated many of the historically grown traffic routes between east and west. The Inter-Zone train can be considered as a symbol for the connection through the Iron Courtain. Often times, the large diesel locomotives of the series 132 were used as traction vehicles for these trains. For this purpose, they were equipped with Siemens I 60 magnets on the bogies. The cars for the trains were provided by both railway companies. Secure yourself this special souvenir! I hereby register for the “Open House Day” at the PIKO Spielwaren GmbH in Sonneberg. 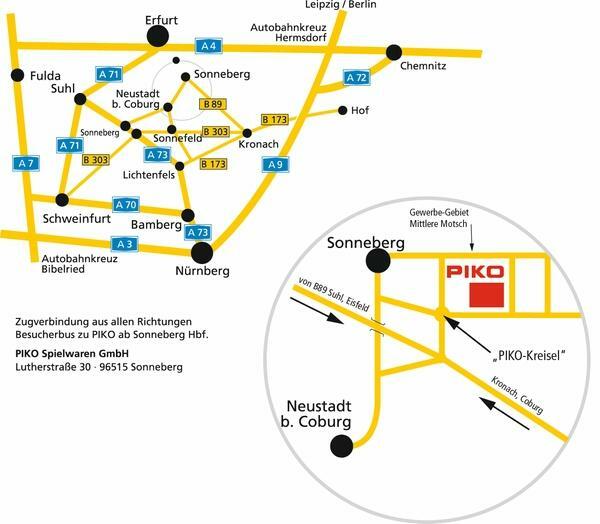 For guests arriving by train, PIKO offers free bus shuttle service from the Sonneberg train station to the PIKO site and back. Vor Ort in allen Ticket-Shops Thüringen.